As his Executive Assistant, I am responsible for ensuring my Director’s time is used in the most effective way possible. This ranges from trying to plan meetings in the same location on the same day to avoid excessive travelling, ensuring time is allocated in advance of deadlines to work on the project or ensuring meetings are scheduled in such a way that there will be no overlaps. This is not always an easy task but over the years I have developed my own systems to help me ensure I am getting the most out of each day. Outlook is a fantastic tool for managing a diary in this way, with wide ranging functionality that helps you plan your time. This can in itself become quite confusing, but Outlook is versatile enough to allow you to move things around, delete, colour, or add as a recurrence that changes are no longer an issue. There is so much Outlook can do that it would be too much to cover in one blog, so I’ve listed below my favourite things about Outlook, and some of the systems I have in place to help in managing my Director’s diary. If you have a weekly, fortnightly or monthly meeting, or a yearly occurrence, Outlook will automatically update this for you without you having to go in an enter each individual appointment. Simply use the recurrence button from within the appointment. This is perfect if you want to make a note that at a certain time each year you need to raise an invoice, arrange an event etc and for weekly meetings/catch-ups. Being able to delete items without having to cross them out is ideal for when you have several possible dates for a meeting. It is not uncommon for someone to send a group of a list of five or six dates for a meeting trying to work out which one is the most suitable. You check the diary, reply saying which you can do and then need to record the times in the diary so that you don’t use the time for something else. Outlook is ideal for this as you can enter all possible dates into the diary (as in the Tuesday morning example above), and then when the date is confirmed you can delete all that are no longer required. As Outlook allows other users to view your free and busy time through the ‘scheduling assistant’, blocking out the times the meeting may take place prevents others from thinking you are free at that time and trying to book another meeting. No one can be in two places at once. Although this is a standard thing to consider whatever diary management system you use, I do find Outlook makes this easier. Don’t just look for gaps in the diary to see when to schedule a meeting, but think about what is happening either side of that meeting. Have you already had two late evenings that week? Do you have a meeting away from the office in the middle of the day? If so, will you want to come back to the office afterwards or go straight home. It may look like 4pm on Thursday would be a good time for a meeting, but would you want to come all the way back to the office at that time for an internal meeting if not urgent? I always put this in the diary either side of a meeting out of the office just to make sure it’s not forgotten about. This also helps when other people may be using the scheduling assistant to arrange a meeting. It shows time when you will be travelling as busy so prevents others from booking a meeting during that slot. There is nothing worse than having a meeting in London at 12pm and someone booking you in a meeting in Reading from 11 to 12! I love the little section at the top of each day on the Outlook calendar. I use this to record tasks or reminders. For example, someone is on leave or sick. Need to chase someone up today or start working on a report, things that need to be done today but at no specific time. It is also useful for recording deadlines. You can also use the tasks function in Outlook for this, but I like to include them in the dairy as I like to have everything in one place so that you can see at a glance what is happening that week. Monday to Wednesday on the diagram above are good examples of how this function might be used. As you will see in the example above, the diary is an array of colours. As well as making my screen look pretty when I’m working, it does have the functional purpose of making it easier for me to read. I personally find it difficult when glancing at a diary to try to differentiate between the types of meetings without having to read a lot of detail. Assigning colours to appointments means at a glance I can see what sort of day my Director has, if a meeting can be rearranged, or if I need to prepare an itinerary or travel arrangements for an offsite meeting. Using this system, I know, just by looking at the diary, without even reading details of appointments than on Monday and Wednesday I have two reminders to action (black colour) , and two days this week when I need to have prepared travel itineraries (green colour for travelling time). These are just a selection of things that can be done to help manage a diary in the most effective way possible. There are however so many more things that can be done with Outlook to help diary management easier. I would be happy to run a DIAL session if anyone wants to find out more. Emma is an award winning Executive Assistant and currently works the Director of External Affairs. She is very busy with work, studying and volunteering and has become a big fan of digital technology and loves how this can help her organise her work and home life. This entry was posted in Uncategorized and tagged Diary management, Microsoft Outlook. Bookmark the permalink. “It is not uncommon for someone to send a group of a list of five or six dates for a meeting trying to work out which one is the most suitable.” < and if they all used Outlook connected to the Uni Exchange server, they could schedule appointments automatically. Excellent article Emma. We need to get something like this up on the ITS website. A series of articles by people who use the systems would really add value. Thanks for your response Anton. The automatic scheduling is actually a feature of Outlook I actually find doesn’t work so well for me in practice mainly because it is quite limiting in what it shows (i.e. free or busy). In reality, it may be possible to move meetings if another takes precedence, which is knowledge that the scheduling assistant can’t know. That said, it is a good way of making sure a meeting gets put into the other people’s diaries. I’m thinking of writing a few more articles about systems I find useful, so if there is anything in particular you think would be helpful, let me know. Firstly, I share the frustration of receiving an email (or Doodle request) instead of a calendar request; it means I have to manually swap back and forth between emailing and calendaring. From that I think there are two shades of ‘busy’ at least, and there are probably shades of ‘tentative’ too, i.e. ‘tentative’ depending on your seniority, e.g. a PVC might have a slot that needs to show as ‘tentative’ to his peer group, but it needs to show as ‘busy’ to me. And there’s the ‘not really tentative nor busy, just on hold for a little while, but if you can wait before trying to work out if I’m free, you’ll see a clearer picture and have more success creating your meeting request’. Say I want to organise a meeting with 5 people, and there are no completely free slots in any of their diaries this side of Easter, but there are four slots where 1 person is ‘free’ and 4 people are ‘tentative’. Do I try each slot in turn? Or do I send four tentative meeting requests to those 5 people for those four slots that make it clear this is a single meeting request with four suggested dates, and not a series of four meetings over four dates? (More work than sending an email with the suggested dates, but can be sped up by copying and pasting the appointment – unless there’s another way? What about polls?). What’s the best way to then handle the 20 responses (firm and tentative acceptances and declines), each of which might have a message in? Especially if I’m doing lots of meeting organisation? What if they all accept a different date, thinking that the three slots are equivalent (which they aren’t once people start accepting or declining)? Is it that people need to check what others have done (accept or decline) before they accept or decline? (Having said that, I don’t think as a receiver of a request that this is possible with Scheduling – although you can see who else has been invited, you can’t tell whether they’ve accepted this particular meeting – unless I’m missing something). Once I’ve decided the best slot from all the responses, it’s presumably then an easy matter to set the best ‘tentative’ one to ‘busy’ (which will send an update) and delete the rest (which will remove them from others’ diaries). Is there an answer in there? A change of practice, and possibly a change of tool (I can see why people use Doodle)? Or is this an example of where there are too many variables – or variations in practice across roles – to gain anything from trying to computerise it? Is it possible to extend the ‘Show as’ list to include more than just ‘free’, ‘tentative’ and ‘busy’? Or maybe somehow shows priorities on appointments (although use of this might vary across the institution). How well does Doodle integrate with Outlook? Anyway, I think I’ve probably thought out loud for long enough about this now. I hope that someone reading will be able to point out what I’m missing and give some nice simple answers that mean less time on diary management for everyone. Although I think the problem should be resolvable by computer, I must admit I think there is added value in people taking a moment to assess the relative priority of meeting X vs meeting Y. I find it is an opportunity to reflect briefly on the purpose of the meetings themselves. I always used to be a fan of Outlook’s meeting management, but a perceived general resistance to its use, coupled with limited inbox size on institutional email servers, led me to move away and use Gmail for the vast majority of purposes. This, of course, adds its own extra problems in relation to organising meetings with others, and I may have to review my choice in the future. I don’t find a context switch to use Doodle to organise a meeting particularly cumbersome. The tool is not perfect, but it does solve some of the problems you highlight (people can see other’s availability quickly, for instance, once they have filled it in). It integrates nicely with Gmail, but I haven’t tried it with Outlook – if nobody has experience of that I may be able to experiment with it soon. We no longer have much of a limit on mailbox size. We have quotas upto about 3.5Gb, but plenty of people beyond that, up to 10s of Gbs. We would like to introduce a form of archiving at some point to make best use of fast/slow disks but as with all these things it takes time. You raise some interesting points Helen, and this is more resaons why I’m not a fan of the scheduling assistant. I prefer to receive an email with meeting dates in – this gives more flexiblity for response e.g. say someone sends the following possible meeting dates for a 1 1/2 hour meeting. Monday 1st – 3pm onwards – free from 4pm to 5.30 p.m.
Doodle is interesting because it combines both ways of scheduling meetings, manually and automatically, however I think it has more benefit for the organiser than those receiving the requests as for them it’s just another programme to have to go into. For the organiser it does provide a simple way of collating responses. In the old days when I had young children and paper diaries I found it quite hard to co-ordinate across my work commitments, my husband’s work, the children’s activities, the child-carers, and our potential social life. Are there technical solutions out there that will help members of the University trying to do this juggling? Interesting to hear all the comments about meeting requests. My own use is a lot more simplistic so I don’t see a lot of the problems. 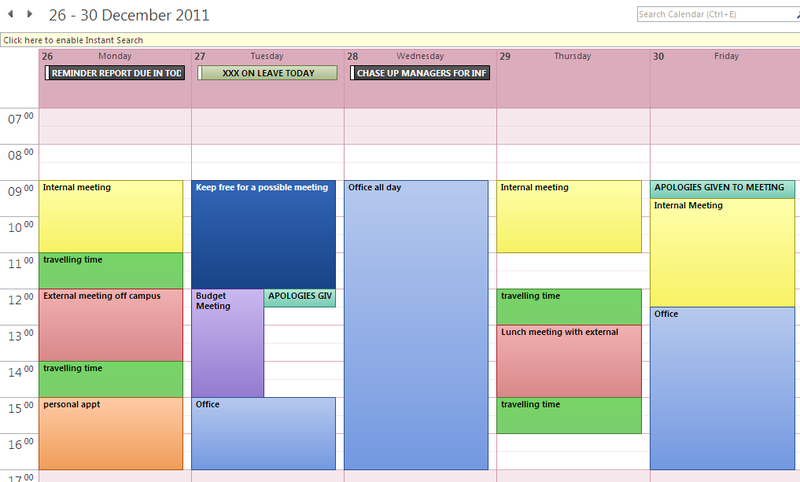 I would rather people just used my calendar to book me in, as the free/busy is easy to keep up to date. In general we (ITS) have never done a good job of selling calendaring use, or indeed many of Outlook/Exchange’s features. It is something I would certainly like to do more of. To follow up on all these comments about Doodle, I would be interested to see what the advantages are – I don’t use it, but then I help run the University email/calendar service so you wouldn’t expect me to. It would be nice to see if there are things we can do better to improve our services and bring people back into the institutional fold. Thanks Emma for your detailed write-up on the effective use of outlook calender. they can schedule appointments automatically. I love this information about how to manage my Diary and I would love to get more information and ideas about this thank you and you really made my day.